Another day at the Renaissance Faire and I am again struck by an interesting observation. 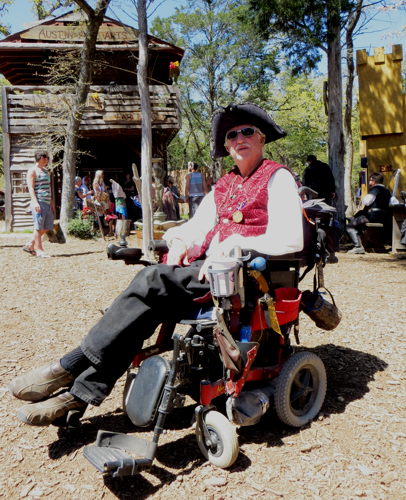 While Renaissance Faires are usually thought of as fun for children who like dragons and younger adults who like wearing costumes and drinking ale, I have noticed a number of people at the faire in wheelchairs and motorized scooters. A case in point is Mr. Thomas Williamson, who was at the faire both in costume and using his scooter to get around. There was an older couple, in full Tudor-period costume, and the husband was guiding his lady who was using her scooter. One wonderful lady had created a dragon costume for her scooter and she looked like she was riding the dragon as she sailed through the faire. I was delighted to see people out and enjoying themselves in spite of mobility issues. At one time, mobility issues kept people at home and they even would feel embarrassed at trying to join in at such celebrations. It is a sign of the generation that spawned these re-enactment events that we get out there and enjoy. It is also a sign that no one took exception to the wheeled visitors and everyone simply merged into the process. This is not an isolated case. Across the country there is a new mobility. There is even a magazine, New Mobility, that discusses the ins and outs of getting out and profiles neat places to go.